Wed. #1 is HERE. To help the website out please subscribe to Mistah MegaManFan so we can reach 1,000 (current count: 822). If you're a gamer you'll enjoy the content! Don't miss Glove Up or Shut Up at 8 PM ET! With the cheap plugs out of the way here's Wednesday's latest news. The Undertaker is "not currently booked for WrestleMania 35" for a match or any Axxess appearances. (WO) He IS however taking bookings outside of those arranged by WWE. For example -- Undertaker is appearing in Liverpool, England on April 28th at a convention called For the Love of Wrestling. 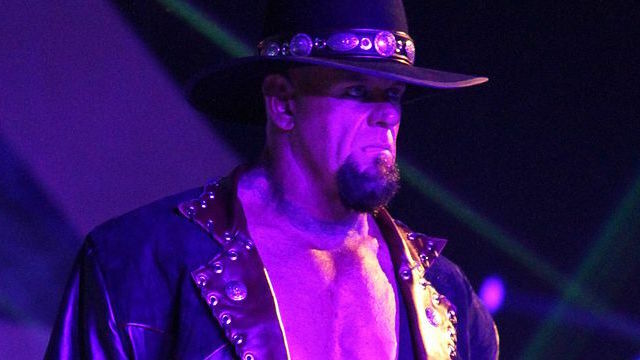 In addition Undertaker will be doing The Rise of the Taker tour in partnership with Inside The Ropes from April 30th through May 2nd in the UK. The next WWE date for Saudi Arabia appears to be May 3rd, but WWE has not officially announced it yet, which definitely leaves the open ended question of whether or not Undertaker would be booked if it DOES happen on that date. A private jet could get him there in time if he was going to be used, and the Crown Prince has made it known in the past he wants the guys he knows and remembers on the shows -- which means Hogan, Undertaker, Kane, Triple H, et cetera -- the guys who have been around for more than a decade+. Consider this also to be nothing more than a rumor -- Randy Orton is allegedly talking to All Elite Wrestling. Coincidentally via Instagram, Mustafa Ali revealed he got a black eye in his match with Randy Orton last night, which Nia Jax wasted no time mocking him for. War of the Worlds, which brings together the top stars from the two best wrestling organizations in the world, has become one of the highlights on the Ring of Honor and New Japan Pro-Wrestling calendars. Since its inception in 2014, War of the Worlds has produced unique, star-studded, action-packed matches with ROH competitors facing and teaming with NJPW competitors. This year's War of The Worlds tour undoubtedly will be the biggest one yet as it will feature the fallout from the sold-out G1 Supercard event from Madison Square Garden. War of the Worlds kicks off in Buffalo on May 8 and then heads to Toronto on May 9 and Grand Rapids, Mich., on May 11 before concluding in Chicago on May 12. Tickets for the four shows go on sale Wednesday, Feb. 13 at 10 a.m. eastern for HonorClub members, and Friday, Feb. 15 at 10 a.m. eastern for the general public at ROHTickets.com. Don't miss your opportunity to witness the best in professional wrestling do battle. Keep it locked into ROHWrestling.com for the full list of NJPW stars headed stateside and for match signings. After SmackDown Live went off the air last night Asuka successfully defended her women's title against Charlotte Flair. In this interview Drew McIntyre talks about NXT UK: "“There's nothing easy about it, but you got lot more eyes on you, and a lot more opportunities. More opportunities than when we were signed. There weren't many UK guys around; I think it was only Paul Burchill that was signed from the UK, unless you go back to the Finlays and Regals who were already living in America and were the first group of guys signed. But it was Sheamus, myself and Wade Barrett who were in that first group that were cherry-picked from the UK and brought to America. Now, you get to train in the UK, you get to experience the WWE, get to learn about how it is with the camera, etc. Then go to a live building, get acclimated with the country and the new culture. So no matter what town it is, it is way better opportunity-wise, and I'm very happy about it. I'm not bitter about it that I had to do it, I'm happy that it is working out well down there." 3:00 PM ET. Here's hollywoodreporter.com/news/dwayne-rock-johnson-goes-indie-fighting-my-family-1182192 a new interview with The Rock for those interested. 5:00 PM ET. Contracts for the Usos (Jimmy and Jey) expire in April 2019. AJ's contract is up soon but he's still in negotiations. (PWI) Many believe the Usos will test the waters of free agency given the new more competitive landscape, but that WWE is going out of their way to keep Styles with the company. If you're interested monstersandcritics.com/wrestling/wwe-exclusive-fox-praises-smackdown-live-relationship-at-tca-plans-to-expand-wrestling-coverage/ a FOX CEO talks about SmackDown Live moving there later this year.